Art club is open to any high school students who are interested in building leadership skills and fostering a greater creative culture in our school. Art Club also gives students opportunities to propose art initiatives such legacy projects, enrichment, and building a personal portfolio. High schoolers typically meet every-other Friday during ELO; middle schoolers meet on Wednesdays. Our homecoming week has something for everyone. Enjoy our pep rally, parade, and athletic events for an entire week in mid-October. Classes and clubs sponsor a variety of dances throughout the year. Keep your ears open for ticket sales and themes. Book clubs are a wonderful way to contribute to a reading culture in our school. We encourage students to read and explore titles they may not otherwise discover. Film club meets Fridays during ELO in the library. We discuss and write scripts during our meetings, practice improvisation, and learn to use cameras, sound systems, and digital mixers. Our service organization, Key Club, offers students community service hours and projects throughout the year. If you’re planning to apply for scholarships, we highly recommend that you take advantage of these opportunities. We meet every-other-week on Tuesdays. M3Challenge is a team of juniors and seniors who solve real world math problems to earn scholarships and aplomb on a national level. Mohawk Equality Alliance (MEA) promotes the acceptance of all people in our Mohawk community. We desire to be examples inclusivity and respect, and to educate others about issues that affect marginalized people groups. Our high school group meets on Tuesdays during ELO; middle school meets on Thursdays. National Honor Society (NHS) recognizes tenth through twelfth grade students who have achieved excellence in scholarship, service, leadership, and character. Students who maintain a 3.3 GPA are eligible to apply. Members of NHS meet regularly to plan service projects and activities in our community. We meet every-other Friday. We explore science topics, organize field trips, and listen to amazing speakers in the science community. We also explore science-related careers in education, medical/dental fields, animal science, and technology. We meet bi-monthly on Thursdays or Fridays. 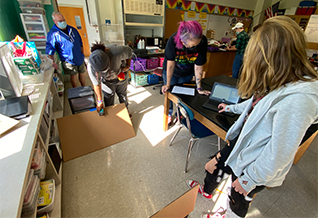 This middle school club explore science, technology, engineering, art, and math (STEAM) concepts to design and build projects like catapults and bridges. We meet during MELO on Tuesdays. Mohawk’s student council provides a forum for student leadership and initiative, and provides all students with practical application of a democratic society. We meet once a week (until Booster Week) then bi-weekly or as needed. Yearbook club produces our school’s yearbook and gives students experience with photo-journalism and editing. We meet Tuesdays and Thursdays in the library during ELO, and are always open to new members. ELO (or Expanded Learning Opportunities) is a 30-minute instructional period during our school day where students receive individualized academic support and homework help, research time for group projects, and time to complete make-up work. Some club and class meetings are scheduled during this time as well. ELO is also an excellent time to utilize our library services. Occasionally, our student services department schedules special activities, such as assemblies or visits from local college representatives, during ELO. Be sure to check the bulletin board outside the Student Services Office for a schedule of upcoming visits.